King Rajendravarman II restored the Khmer Empire’s glory. Jayavarman IV had moved his capital 90 miles northeast to Koh Ker. A succession crisis followed his death, until one of his sons, Harshavarman II, took the throne. But he died a few years later. Rajendravarman, his cousin, succeeded him. After this turmoil, the Khmers needed a strong king who could unify them. Rajendravarman delivered in spades (or better, barays). He brought the capital back to Angkor, extended the empire, and built some of the Khmers’ greatest pre-Angkor Wat monuments. I explored Pre Rup after going through Angkor Wat several times, and still found it impressive. Rajendravarman built his capital in the middle of the south bank of Angkor’s East Baray, and constructed Pre Rup there. This location is about 4 miles east of Phnom Bakheng, the centerpiece of the first city at Angkor. So Rajendravarman was making a dramatic new start. But he was building on old ideas that earlier kings established at the Bakong and Phnom Bakheng. 1. 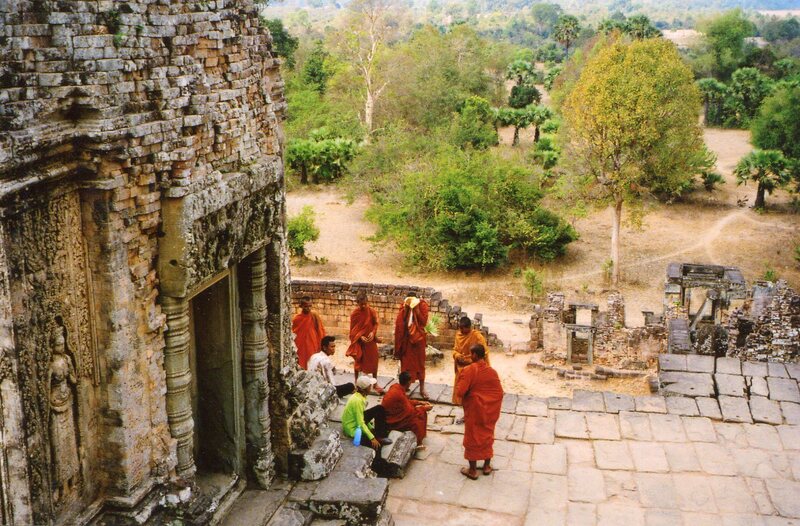 Like the two older monuments, Pre Rup is a temple mountain that housed the public royal cult. It has 5 central towers–4 peaks surround a taller middle one. This form imitates Mount Meru, the mountain in the center of the universe in Hindu mythology. 2. 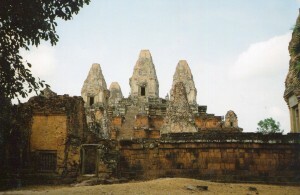 Pre Rup is large and symmetrical, like the Bakong and Phnom Bakheng. Its towers rise from a square multi-tiered platform. Rajendravarman took the Khmer empire to new levels of organization by replacing local lords who owned their land with appointed officials who reported to the Khmer king. 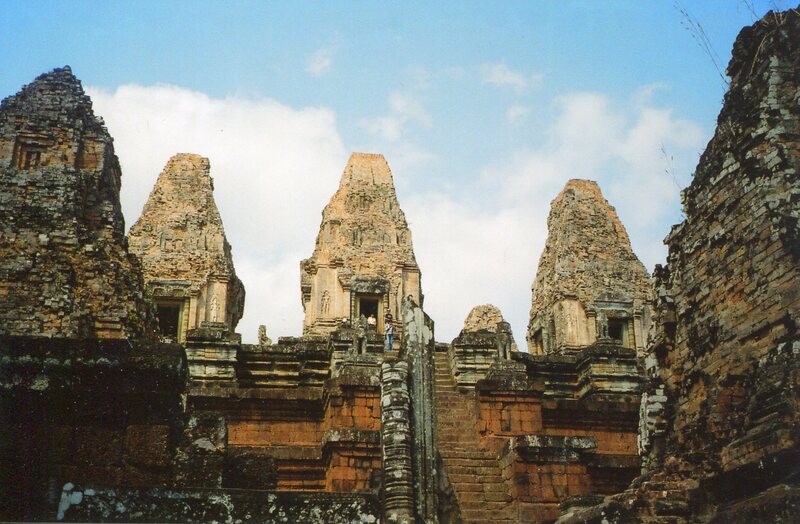 Angkor was on its way to becoming the huge empire that would rule half of Thailand and Laos. 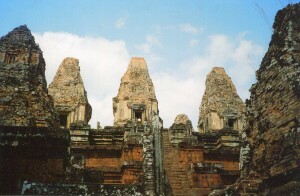 Pre Rup’s combination of symmetry and overwhelming size was a model for order and two-down control, as the Bakong and Phnom Bakheng were. But Rajendravarman had a master builder called Kavindrarimanatha, who made the temple’s proportions very pleasing. Was he dressing a tiger in silk? Maybe, but I was seduced more than 1000 years later. 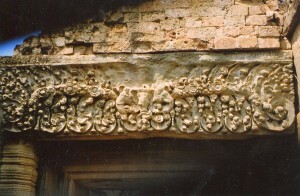 Above, you see a lintel carved in a similar garland with dense vegetation that older temples used. It’s dense and animated, yet elegant and ordered. People must have thought that Pre Rup controls the mystical powers in nature that bring in the monsoons and keep the people in order. The Pre Rup style of sculpture brought back the aloof formality of the Phnom Bakheng type. Rajendravarman brought the livelier figures of the Koh Ker period in line, as though he and his master builder told the artisans, “Stop messing around, we have an empire to build.” Their statues are stately, but I don’t think they’d hear me if I were to pray to them. They might have been only for kings and elite priests. Local farmers must have had a wealth of ancestral and spirit cults that felt more familiar. The compound around Pre Rup’s central platform is full of buildings that are symmetrically arranged. As you enter from the east, three towers greet you on each side. Behind them, you pass through the gate of a surrounding wall. Then you see long galleries that surround the temple’s center. A building on your right, and on your left, called a library, might have housed scripts, statues and vestments back in the day–Angkor Wat has six of these buildings. So Pre Rup is stately throughout. Rajendravarman anchored his growing kingdom with art that stressed order and power. Pre Rup was his biggest monument, and it set a new standard of majesty for the growing empire. Exploring it today is still humbling. 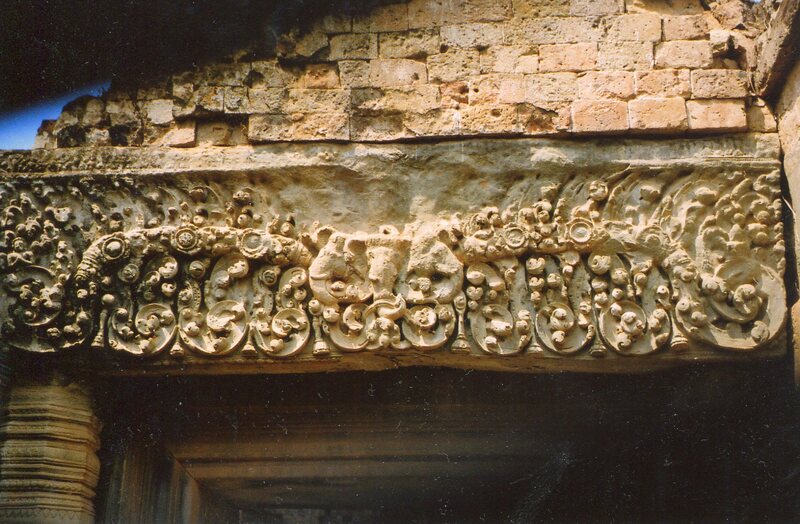 You can see new artistic directions that shortly developed in the temple of Banteay Srei. This is many people’s favorite Khmer monument. Next post: Banteay Srei, The Most Beautiful Khmer Temple?